Sega's Heat Up Air Hockey 4 Player Table puts a whole new spin on traditional air hockey gaming. Heat Up uses a large overhead projector to display digital images on top of the table, while over 80 sensors on every side track the movements of the puck, allowing it to interact with the images. If the puck hits any of the block-like shields projected in front of the goal area, a physical panel behind it will go down and let you score. You can even adjust shield numbers to impose handicaps, and on top of this, the game includes moving targets that act as power-ups when the puck moves over them. You can also enter various bonus stages for instance the silhouette stage. Fun for the whole family, Sega's Heat Up Air Hockey 4 Player Table is an exciting gaming experience sure to draw a crowd to your gaming location. Sega's Heat Up Air Hockey 4 Player Table puts a whole new spin on traditional air hockey gaming. Heat Up uses a large overhead projector to display digital images on top of the table, while over 80 sensors on every side track the movements of the puck, allowing it to interact with the images. If the puck hits any of the block-like shields projected in front of the goal area, a physical panel behind it will go down and let you score. You can even adjust shield numbers to impose handicaps, and on top of this, the game includes moving targets that act as power-ups when the puck moves over them. You can also enter various bonus stages for instance the silhouette stage. 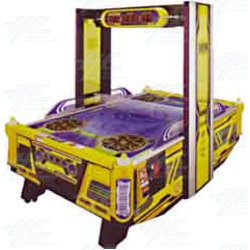 Fun for the whole family, Sega's Heat Up Air Hockey 4 Player Table is an exciting gaming experience sure to draw a crowd to your gaming location.